The implementation of Slop results in the creation of a price range above and/or below the spread order entry price at which you are willing to be filled. Because Autospreader will not reprice the quoted outright legs while your spread price remains within the Slop range, Slop can minimize the excessive quoting that occurs in the individual legs of a working spread order. When Slop is used, the price differential of the spread changes as the prices in the outrights move. As the markets in the outright legs change and the spread price moves out of the slop threshold, Autospreader reprices the quoted outrights to maintain the spread differential price that was entered into the Autospreader pane. Basic Slop uses one level of inside Slop and outside Slop to determine when to reprice the quoted outright legs based upon movement in the market. Entering spread values in the Slop fields creates a price range above and below your spread order entry price, telling Autospreader not to requote the outrights until this range is breached. The number or value you give to Slop depends on your individual spread. Each spread has its own tick value based on the multiplier and tick size in each leg. Once you determine the tick value of your spread, you can decide the Slop value. Say you want to create a price range three price levels above the spread bid or offer and three price levels below the spread bid or offer. First, determine the minimum tick size of the spread, which is based on each leg's multiplier and tick size. In this example .05 is the minimum tick increment for this spread. Three price levels in .05 increments is .15. By typing .15 in both the Inside Slop and Outside Slop fields, you create a range three prices levels above and three prices levels below your working spread price. If you enter an order to buy one spread for .25 with both Inside Slop and Outside Slop set at .15, you create a range from .10 to .40, which is three spread price levels above the bid of .25 and three spread price levels below the bid of .25. 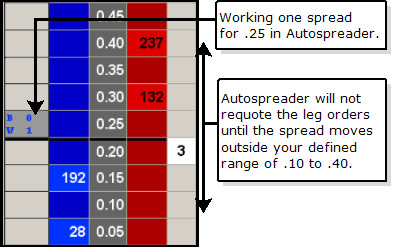 If the spread price remains within a range of .10 to .40, Autospreader® will not reprice the working leg orders. Within this quoting range you are willing to pay as high as .40 or as low as .10 for the spread.